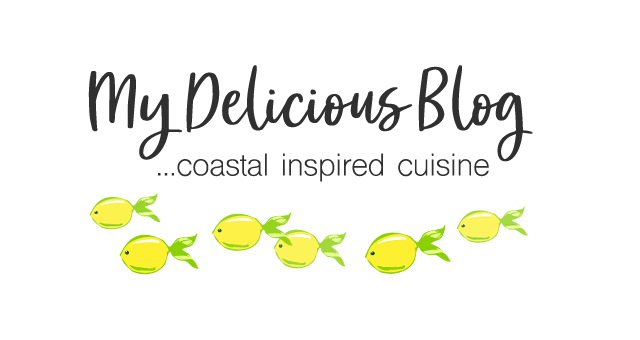 This article (and recipe) titled Seasonal Summer Treats in Florida was originally published at Visit Sarasota. Please follow them on their website or through social media: VisitSarasotaCounty Instagram, VisitSarasota Facebook, VisitSarasota Twitter. 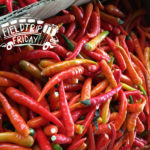 Summertime in Florida offers an abundance of fruits and vegetables, and visiting farmer’s markets is a culinary treat, with all the colors, shapes and smells of beautiful, fresh produce. When something is in-season it’s at its peak in terms of freshness and flavor, so those are the first things I reach for when planning my meals. Today I’m writing about a few that are in season through most of the summer, so keep an eye out for them! 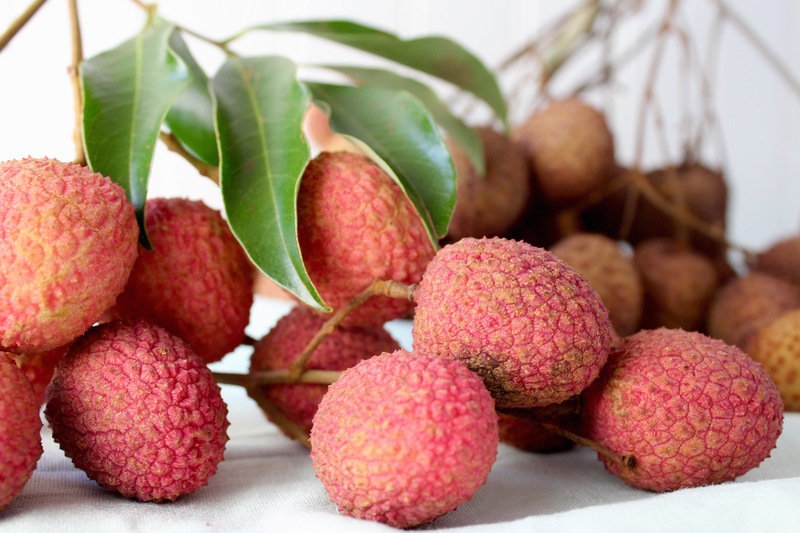 Lychee: These sub-tropical fruits grow well in coastal central and south Florida areas and are harvested May-July. Their reddish-brown, bumpy skin might seem a little daunting at first, but they peel easily and produce a soft, juicy, translucent ball that sort of looks like a peeled grape. 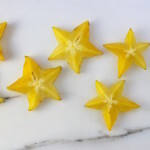 They have a wonderfully sweet, delicate, floral flavor and aroma, and the best way to eat one is to just pop it in your mouth and spit out the big (inedible) seed. 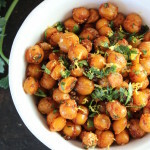 These little guys are also great in sweet or savory salads, drinks and desserts. Not only are they tasty, they’re also high in Vitamin C, so they’re really good for you! I found these at the Sarasota Farmers Market. Avocado: There are two main types in the U.S. – Haas avocados are from California and have that familiar black, bumpy skin, and Florida avocados resemble the shape of a pear with a smooth, bright green skin that doesn’t darken as it ripens. The Florida variety has golden yellow flesh that tastes bright, grassy, with almost a nutty undertone. It’s also noticeably larger, providing a more significant yield at a typically lower price. They’re harvested late May-March. Mango: Several varieties grow in Florida primarily throughout southeastern and southwestern regions, and many can be found in home gardens throughout the state. When these babies come into season, they fly off the shelves at markets, and if you’re lucky enough to have a tree, your neighbors will likely come calling, hoping you’ll share! 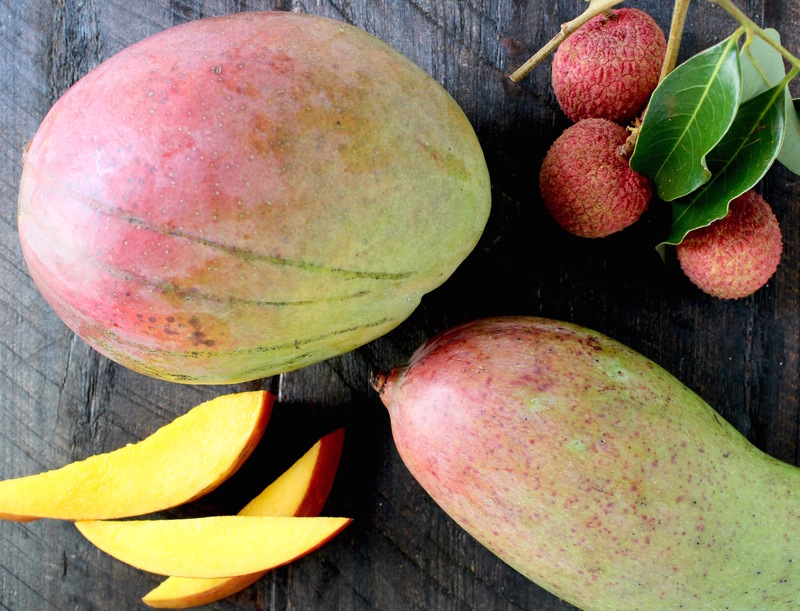 Mangos are juicy, sweet and offer a distinctly tropical flavor — great in smoothies, salads, salsas and so much more. I usually just cut one up and eat the whole thing! They’re harvested in Florida May-October, but June/July is usually peak. I also found these beauties at the Sarasota Farmers Market. 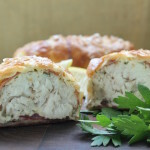 This recipe incorporates all three. . .it’s Asian-inspired, fresh-tasting, pretty, and definitely a good choice for hot summer days. Enjoy! Lychee, mango, avocado and roasted shrimp pair nicely together for this delicious summer salad. Steam or roast shrimp for a few minutes until pink (don’t overcook!). 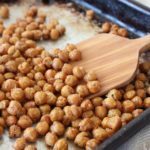 Remove, place on a paper towel-lined dish and refrigerate 15 minutes. 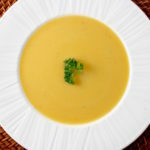 In a small bowl, combine dressing ingredients and whisk until sugar dissolves. Refrigerate until ready to serve. 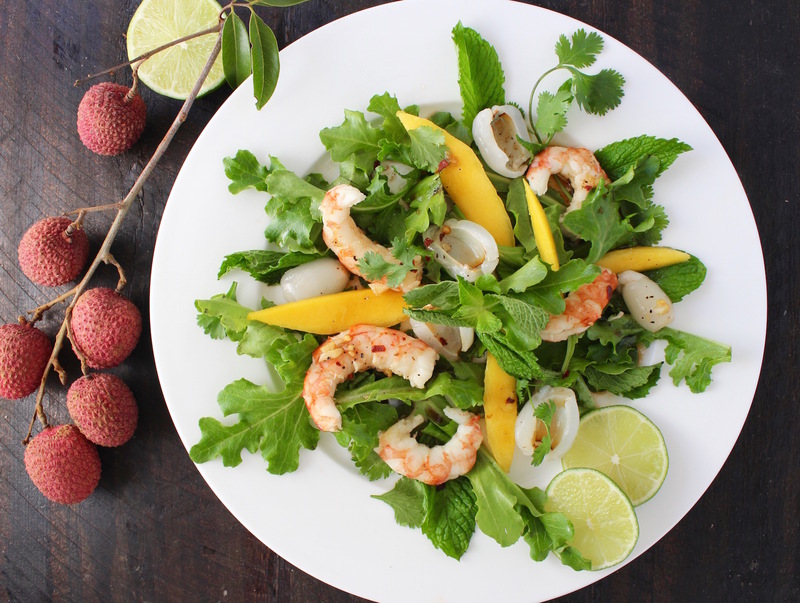 Arrange greens, avocado, mango, lychees, mint, cilantro and shrimp on two pretty dishes. Sprinkle with dressing and serve. This salad is not only very pretty and colorful , it looks delicious!